In this study, we present a detailed investigation of luminescence properties of a blue light-emitting diode using InGaN/GaN (indium component is 17.43%) multiple quantum wells as the active region grown on patterned sapphire substrate by low-pressure metal-organic chemical vapor deposition (MOCVD). High-resolution X-ray diffraction (HRXRD), atomic force microscopy (AFM), scanning electron microscopy (SEM), Raman scattering (RS) and photoluminescence (PL) measurements are employed to study the crystal quality, the threading dislocation density, surface morphology, residual strain existing in the active region and optical properties. We conclude that the crystalline quality and surface morphology can be greatly improved, the red-shift of peak wavelength is eliminated and the superior blue light LED can be obtained because the residual strain that existed in the active region can be relaxed when the LED is grown on patterned sapphire substrate (PSS). 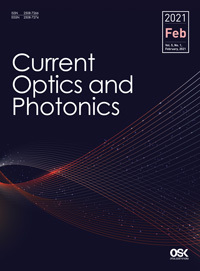 We discuss the mechanisms of growing on PSS to enhance the superior luminescence properties of blue light LED from the viewpoint of residual strain in the active region.